Color: Pale gold. Bouquet: Seductive perfume of fresh apricot, peaches, and ripe pineapple. 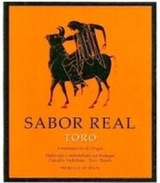 Taste: Fruity sweetness with a full-bodied structure and refreshing acidity. Serve lightly chilled. 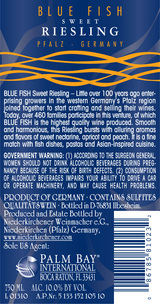 Blue Fish Sweet Riesling complements the flavor of shellfish, mussels,Asian-inspired cuisine, and mild cheeses. The wine is also perfect for sipping on its own while enjoying a warm summer night. The Blue Fish series of cheery, fruit-forward Rieslings provides consistent quality at an easy price point. 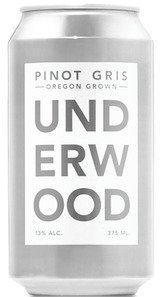 Ripe white peach and grapefruit flavors are plush and sweet but balanced squarely by a squirt of lemon-lime acidity. Enjoy now for it's fruity exuberance.